It is the aim of this project to produce a workable bloom from local materials as authentically as possible. 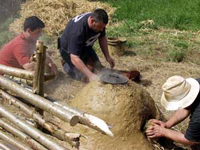 The making of iron using an early furnace is acknowledged to be difficult. This experiment attempts to recreate the process with the additional handicap of using only locally obtained resources. 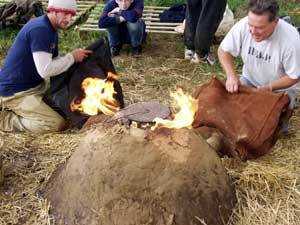 The charcoal will be the only possible exception, it being sourced from a supplier 12 miles away, all other materials will be obtained from Whitehall farm. Evidence of iron working has been found at Heyford Villa during excavations carried out in 2000-01. This has taken the form of a bloom and several substantial pieces of bloomery slag spread in a stratographic sequence suggesting a date no later than 300CE. Evidence of early ironworking in Northamptonshire has been documented at Laxton, Wakerley and Bulwick (Jackson and Tylecote Britannia [198?]). district for iron ore, it likewise has at the present time, 12 blast furnaces." This experiment is the first part of an ongoing paper that will seek to explain why this gap of 1400 years occurred, hence the reliance on local materials. It will also give a clearer idea of the problems encountered in the process. It is worth noting that prior to the writer's degree he was involved in most practical aspects of iron and steel production and the working of the finished product. Ironstone was collected from the surface during the course of the excavation at Whitehall farm July 2001. It was broken into pieces of no more than 25mm and washed to remove all Jurassic sand deposits. Evidence of calcined ore has been found at Heyford (2001 Report to follow). Due to the quality of the ore it was decided to calculate the ore. This consisted of digging a pit 600mm x 900mm x 300mm deep. 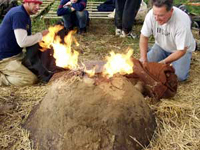 A charcoal fire was lit, the ore placed on top and covered in turf and soil to provide a semi airtight seal. This process was unsuccessful as the ore was only partially calcined. A second attempt did not cover the ore with soil and was a complete success, the ore turned a deep red and became very brittle. Charcoal was obtained from sustainable managed forest and mainly consisted of hazel lump-wood. The pieces were broken into pieces of less than 100mm. 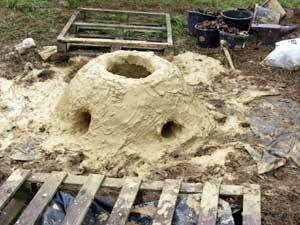 The smaller pieces and dust were collected for the initial firing of the kiln. The furnace was blue clay found in a local field at a depth of Imtr. 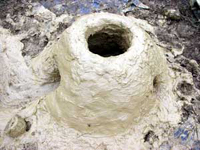 A shallow pit was lined with clay to a thickness of IOOmm and a concave shape formed in the centre of the floor lining to provide a slag trap. The base thickness of the walls measured 300mm tapering to I00mm at the top. Two tuyere blow holes were allowed. A third aperture was formed to allow final extraction of the bloom. 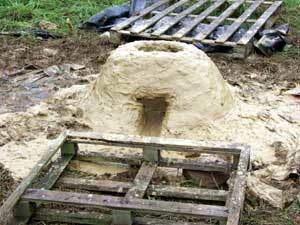 An initial firing of straw, scrap timber, twigs and charcoal dust partially hardened the inside of the furnace. This also allowed the bellows to be tested. On completion the interior of the furnace was checked for cracks, any found were re-sealed with a clay slip. 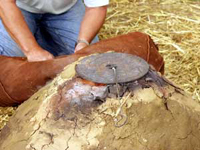 The bellows were constructed from leather sourced locally. An original tan of beech and urine is no longer available, so a conventional chemical 2mm tanned hide was used. No evidence of bellows from this period survives therefore the simplest possible construction was employed. A single hide was cut square and folded in half, a gusset of I00mm was sewn in the sides using leather twine. The open ends were fitted with stiffeners. The front had two pieces of 4mm hide riveted to it with copper rivets. A hole was cut through the three thickness to allow the push fit of a tuyere. The tuyeres were produced from local clay and were a rough trapezoid measuring 610mm long, 100mm outer dia at flange and 50mm dia at outlet; the wall thickness throughout was 20mm. 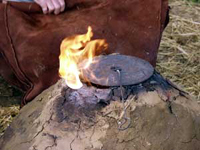 The tuyere/s were placed in the furnace's inlet aperture and sealed with clay. The weather, week commencing 16.7.01 was extremely wet and did not allow the furnace to dry sufficiently! 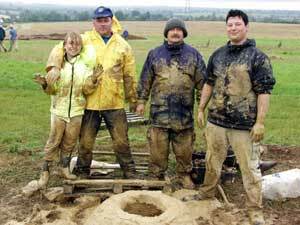 Therefore the only firing possible was on Sunday 22.7.01 (the open day and fund raising of an ongoing Roman villa excavation). No pyrometer was available so it was decided to watch the flame for an indication of temperature. 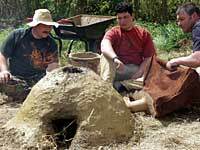 The tuyeres were placed at a 90-degree angle and centred in the furnace, they were then fixed in place with clay. The slag hole was filled with a stone and likewise stopped up with clay. 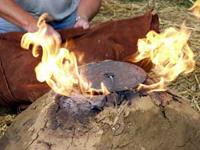 A wood fire was lit and charcoal placed on top. Due to the wet condition of the furnace this was allowed to sit for 30 minuets before blowing. Calcined ore was and mixed with charcoal at a 2:1 ratio then pounded down to pieces of less than 25mm, a small amount of powdered limestone was added to the mix and placed in the furnace as an initial charge. This was blown with both bellows, it took less than 2 minutes before white flames indicated that the required heat had been obtained. Due to cracking and the possible collapse of the (still) wet surface walls, it was decided to layer the charge and support the inner surface of the furnace ie charcoal followed by ironstone without mixing. This technique has been shown in several diagrams of the process. The first unmixed charge was introduced 6Kg of crushed charcoal followed by 3Kg of Ironstone. A further 1.5 Kg of charcoal was added to the top of this charge and blown continuously. The same quantities were added and again subjected to continuous blast. The same quantities were added and again subjected to continuous blast, however the flame became a clear heat haze, it was decided to blow using only one set of bellows. The same ratio but in double quantities were added and again subjected to continuous blast from one set of bellows, however the heat output fell (using the flame as an indicator) so the second set of bellows were re introduced until flame reached required colour and then were discontinued. The same quantities were added as above and again subjected to continuous blast from two sets of bellows using criteria set out above. 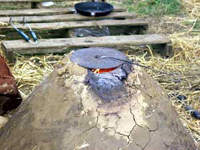 3Kg of raw charcoal was added as heat levels in kiln were falling, Two bellows were used using criteria set out above. 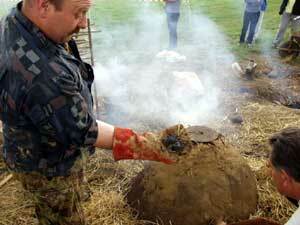 Final charge of 6Kg charcoal and 3Kg Ironstone added, two bellows were used using criteria set out above. An unburned area of charcoal was noted around (approx.) one third of the inner wall nearest to the tuyeres, blowing seemed ineffective and the heat within the furnace fell. However molten nodules were also noted within the mix. The mix was probed and a large solid mass was found fixed to the furnace wall. The firing was discontinued. The slag hole was opened, no tappable slag was found, the hearth was cool and empty beneath the now solid mass 300mm above the furnace floor. On examination this mass consisted of 15Kg of solid iron and slag. I The furnace was wet at the initial firing, indeed the outside was still wet after the experiment which only continued to give open day visitors a display, the experiment per se was written off at 7.00 am when the first cracks appeared inside the furnace. 2 The visitors (whilst accepted as our reason for being there) proved to be a serious health and safety risk and therefore it was decided to keep the furnace partially covered for most of the duration of the melt, therefore obscuring the colour of the flame except when removed. 3 The lack of pyrometer proved to be a mixed blessing: the feel of the metal was enhanced, but there was no way of monitoring the temperature as an ongoing factor. 4 The bellows, while primitive were very effective. The furnace will be allowed to dry fully before use. There will be no spectators. There will be a 3:1 ratio of ore to charcoal. It will be premixed before introduction to the furnace. We will use a pyrometer. The furnace will not be covered.